Got the $$$ may leg it to the Bahamahs if not will post games. good luck this week horses!! hope ya crush em!! run good, run strong!! remember, if the bad runs are still a profit, it's a good thing. Ok will clarify with Sand, I was under the impression I was playing up to 10NL again from our board discussions ($40 - and I got started before the official thread was posted since I had time to play last night) so if that's not the case I won't be able to 4 table 10NL like I did last night. it's ok on $20 I can play 4PLO the rest of the way. At any rate, after a rough start last night that included running QQ into AA almost immediately, AKs into a 60bb stack's KK, and what I thought was a good bluff spot that happened to run into the very top of the villain's range (all within the first 200 hands) I did grind it back up to a small profit. Won't be playing again until the weekend I think, holiday week here, but I will aim to finish up the 1K hands for this week since I was able to get almost 3/4ths of them in last night. 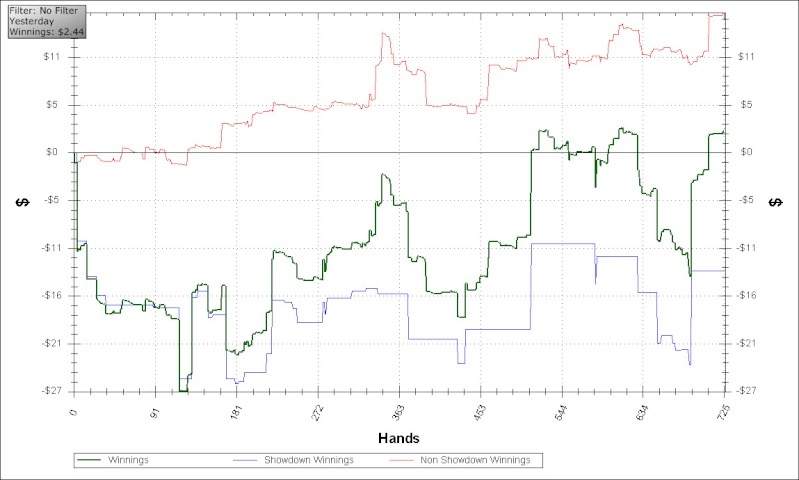 Just for fun here's the graph of the session, you can see the 3 big "showdown" losses I took early. Actually for the session as a whole my W$SD was really bad, 43.6%. Thank goodness for smart aggression and non-showdown winnings. And for not being a tilt monkey, or this may have ended as a full -$40. Same to you.. profit is a profit. Bacapone48 wins the tournament and receives $3.02 - congratulations! vampir 99900 finished the tournament in 2nd place and received $2.86. CheckMan!44 finished the tournament in 3rd place and received $2.80. wetmoose 613 finished the tournament in 4th place and received $2.66. mark^terry finished the tournament in 5th place and received $2.16. thats right. profit is profit is profit. we'll gladly take every penny. and thnx again for your time and work folks!! Usually won in showdown is up and won without showdown is down..
serggio01 wins the tournament and receives $3.68 - congratulations! acx32 finished the tournament in 2nd place and received $2.74. MM1ghty finished the tournament in 3rd place and received $2.58. wetmoose 613 finished the tournament in 4th place and received $2.35. kaniolbn finished the tournament in 5th place and received $2.15. I agree with John, any profit is a good thing, every little bit helps. Thanks for all the hard work, guys. Trap, received the money and will probably play a game later. I have received funds and will be playing shortly. Playing game 1 - 646741070 Finished 6th. Surprised I made it that far. No cards at all. Shuggy65 wins the tournament and receives $14.87 - congratulations! sherwd78 finished the tournament in 2nd place and received $13.39. croucoudile finished the tournament in 3rd place and received $13.21. MizaMax finished the tournament in 4th place and received $12.33. jossix111 finished the tournament in 5th place and received $12.20. Good try Bman, it's tough when you're card dead.